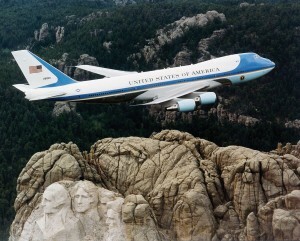 “Air Force One over Mt. Rushmore” U.S. Air Force File Photo. I know I am a little biased due to my preference for Boeing over Airbus, but the announcement that the latest variant of the 747 will be the new Air Force One really isn’t a surprise to anyone that followed the process at all. It honestly would not look good to a lot of people to have the American President flying in a French plane. Just to be clear, the callsign Air Force One applies to any Air Force aircraft that is carrying the president. Which is why the S-3 Viking that carried President Bush onto the deck of the USS Abraham Lincoln was Navy One, because he was on a Navy plane. The presidential helicopter bears the callsign Marine One when the president is on board. Sorry for the lesson, I will get back to the story at hand. Almost two years ago I wrote a piece about the 787 being a potential replacement for the presidential fleet of three aircraft. I doubt that it was ever really an option because of the requirements they have for these aircraft, but it was kind of fun to think about it. The latest version of the queen of the skies is a fitting fixture for our President to strut around the world in. This plane is not just a means of transportation for a powerful leader, but a symbol of his office and the power that it bears. It was a clear decision to pick the most majestic aircraft that is manufactured in America. The A380 would have been a perfectly acceptable choice as well, along with a few other options, but the symbolic nature of this aircraft really made this choice a no-brainer. The new planes won’t join the 89th Airlift Wing (the presidential squadron) for about eight years, so we will have gone through at least one more president by the time it enters service. However, I’m sure I speak for all the other avgeeks out there when I say I hope we get to see some of the development, but I’m not naive enough to think we will see much of anything. DHS and Other Federal Agencies Wasting Time and Money Searching Aircraft? I make it no secret that I am not a fan of TSA. They like to waste a lot of money, and I don’t feel that they are as effective as they could be when I hear about people accidentally getting large knives through security. That being said, they do prevent many weapons from getting on airplanes, and probably more importantly they deter more than we will ever know. On the other hand I feel like other agencies are on a bit of a wild goose chase, and in some people’s opinions are targeting completely innocent people. I came across an article from The Atlantic written by James Fallows talking about the rash of pilots being searched by various agencies for no apparent reason and it reminded me of an experience I had a few years ago. 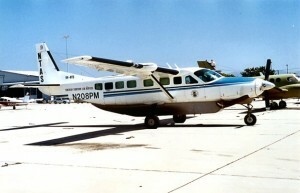 The Cessna 208 Caravan is used by numerous cargo carriers all over the world. I was working at an FBO in Austin, TX pulling the night shift which was generally pretty boring. Other than the occasional late businessman most of our work involved getting ready for the next day, and handling the same few cargo planes that came in every single night. We actually became friends with these pilots as they were our only company at night. On one of these routine nights, we had a Cessna 208 Caravan come in with a pilot that had been flying this same route for at least five years. I went out to greet him as I always did, and as I stood up from chocking his plane I heard another jet pull in that I hadn’t even seen because it pulled in so fast. I quickly grabbed another set of chocks and ran over to the jet to chock it as well when I saw the words Border Patrol painted on the engines. I approached the plane like always and greeted the crew asking what I could do for them. It was about that time that I realized they had weapons out and they just lifted a hand and told me to wait, so naturally I did. I merely went about my normal job just watching them all from a distance. The Border Patrol agents performed their search without incident took a few hundred gallons of fuel and left within about two hours. When I asked the pilot what was going on he said they felt he had flown to close to the Mexican border so they had followed him up for about an hour or so just to check the plane. Just to be totally clear this is what happened. A registered cargo carrier that flies the exact same route, in the exact same plane, with the exact same pilot, at almost exactly the same time every night MIGHT have flown straight on departure a little longer than usual. In response four Border Patrol agents flew a private jet for a couple of hours to poke around at a few boxes, buy $6,000 in fuel, and go back home for the night. In talking to the pilot this happens about once a year or so, which is an incredible waste of time and money. In the grand scheme of things $6,000 isn’t that much money, and it wasn’t a terrible inconvenience for the pilot who has become accustomed to it, but that isn’t something that any normal law-abiding citizen should have to deal with. These agencies do provide a valuable service with certain things that they handle, but it seems to me that some of the decision-making processes need to be reviewed. If people are really being profiled in any way like the above article suggests then they may need a little more than a simple review. Contrary to popular belief, the U.S. Senate is capable of getting something done. Today, on New Year’s Day nonetheless, they confirmed Michael Huerta as FAA Administrator. Huerta has been serving as the acting administrator since Dec. 2011, and previously served as deputy Administrator starting in June 2010. Huerta was originally nominated to become the FAA administrator by President Obama in March 2012, but had to wait nine months for his confirmation to go through. I am sure this was no surprise to Mr. Huerta as he had to wait over five months to be confirmed as deputy Administrator. This confirmation, which carries a term of five years, will provide some much-needed stability for the FAA in tandem with the FAA reauthorization which was signed by President Obama last February. Based on his success in his previous roles there is great reason for optimism. His first real claim to fame was as a managing director for the 2002 Olympics overseeing the transportation outlets for the Games. Having lived through the transportation mess that existed before the Olympics, and enjoyed the improvements afterward, I can personally attest to the success of his efforts. His confirmation is already being applauded by aviation organizations such as GAMA. 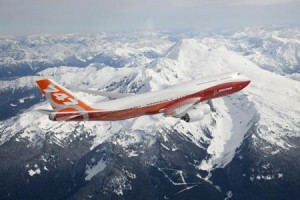 Could the Boeing 787 Dreamliner be the New Air Force One? There is probably not a more recognized plane in the whole world than the one that carries around the President of the United States. It has been photographed more than any other plane in the world, it was the centerpiece of a major movie starring Harrison Ford, and it is getting pretty old and worn out. Just to be totally accurate, Air Force One is technically the callsign of any Air Force aircraft that is carrying the President, just as Marine One is a Marine aircraft carrying the President. Multiple aircraft have carried the title of Air Force One over the years, but it is currently associated with two Boeing VC-25As which are highly customized 747-200Bs. The first VC-25A was delivered in 1990 which means that these aircraft are coming up on a quarter century of flight around the world. While that is not exceptionally old by some standards, this platform is getting old as most airlines have retired these older models of the 747 which means that maintenance costs continue to rise as parts become less common. So what aircraft is going to replace this iconic platform? The Air Force put out a request for a replacement back in January of 2009 to have a new plane in service by 2017. A couple of weeks later, EADS(Airbus) took themselves out of the running leaving Boeing as the sole bidder, with the 747-8 and the 787 Dreamliner as the proposed offerings. 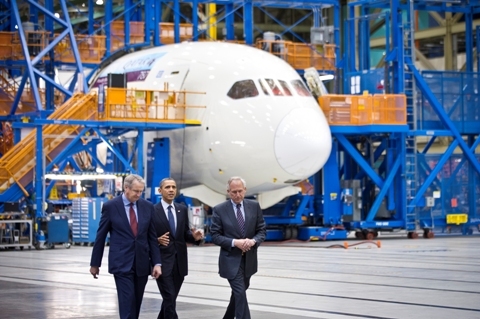 President Obama tours the 787 production line with Jim McNerney, Chairman, President & CEO of The Boeing Company (right) and Jim Albaugh, President & CEO of Boeing Commercial Airplanes. Photo by Marian Lockhart. Interestingly, President Obama toured the facility in Washington where the 787 Dreamliner is assembled. I don’t think that is necessarily an indication of an impending decision as much as a political move of some sort, but it certainly gets the wheels turning. The 787 Dreamliner is arguably the most innovative aircraft in the world right now. Its carbon fiber construction, and high-tech roots make it incredibly suited to all types of applications. One of the biggest appeals is the fuel-efficiency and eco-friendly buzz words that make so many people swoon these days. From everything that we can tell the Dreamliner is a great aircraft that is living up to the hype, but it is hard to know how good a plane really is until it has some real-time in service. That being said, I can think of a couple of reasons that this would be a very appealing choice for the most powerful office in the world. As I already mentioned, being able to use those great buzz words of fuel-efficient and eco-friendly are just the type of thing that a president who is so worried about his image on the international stage would eat up. America has a terrible reputation when it comes to fossil fuel emissions and replacing the biggest fuel burner in the US government would definitely help that image. Being in an election year where the economy is far and away the number one issue, picking the Dreamliner would be a great move from a political standpoint. The purchase itself wouldn’t mean a lot since it is only for three planes, but it could make a huge difference in the grand scheme of things. I’m sure Boeing would love to have their new baby shown off to the whole world every time the President gets on and off his plane. How many airlines would at the very least take a more serious look at the Dreamliner if the President of the United States called it his personal jet? It is one thing to go and tour the plant and say that it is a great airframe, and all of the factory workers are doing a great job, but it is quite another to pick that plane to replace the most photographed, highly recognizable plane in the world. Like so many other companies across the country, Boeing can use all of the help they can get. Lawmakers reach deal on labor to clear FAA funding for takeoff – The Hill’s Transportation Report. Apparently Congress finally heard something that people were saying. This to me was a no brainer, and the shocker is that it took so long. I am glad they were able to get past their differences and make something happen. Obviously the bill is not passed yet, and they specifically said there are still some other issues to work out, but it should be able to go through now. At this point only Harry Reid has released the news, but that is at the very least a good sign because he is the vocal leader of the senate. I think it is great that the bill is expected to last four years. That should give the FAA some time to really get things done. With all of the stuff that needs to get done they really needed some time to make it happen. Millions of people step onto planes all around the world without a single thought of the regulatory agencies that control the industry. In the US we are lucky to have the safest airspace in the world, but no one thinks of that while they ignore the pre-flight instructions from the flight attendants. The vast majority of people will never talk to the air traffic controllers at airports and en route control centers throughout the country, but they are there everyday to keep fliers safe. People are probably even less likely to ever meet the countless inspectors who ensure that aircraft, pilots, mechanics, and dozens of other professions do their job properly. According to Michael Huerta, acting administrator of the FAA, civil aviation contributes $1.3 trillion to our economy and generates more than 10 million jobs. The FAA oversees all of that, but for almost five years they have been working on temporary time. Since 2007, when the last authorization bill was passed, there have been 22 extensions, and we stand poised on the edge of number 23. Congress has until January 31 to get a new bill passed, but based on their inability to do pretty much anything I do not have my hopes very high. Apparently the whole bill is hung up on one portion which specifies voting procedures for unions. While it is an important point of discussion, it is something that should simply be taken out of the bill for now so that everything else can move forward. The lack of an authorization bill is not only keeping everyone in the FAA on their heels, but pretty much everyone involved in aviation. Airports are not starting some projects they other wise would because they are waiting on funding from the FAA. Funding that the FAA cannot hand out until they are authorized to do so. Arguably more important than that, is the inability of the FAA to really push forward with the NextGen air traffic control system. Again, most people don’t think much of it, but the reality is that the new system will create jobs, save on fuel costs, and make air travel for efficient for everyone involved. This Congress seems to be content with doing nothing simply to spite the members of the other parties, but that is completely unacceptable. They were elected to do a job, and so far they have completely failed to do it. Below you will find the full text of a speech given by Michael Huerta, the acting administrator of the FAA, during the New Horizons Forum. The Forum was held in conjunction with the AIAA Aerospace Sciences meeting in Nashville, TN. He brings up a lot of interesting, and incredibly important topics that I will discuss further in the coming days, but I felt the full text was valuable. With all of the confusion in the government, and the FAA in particular his comments are very thought-provoking. Thank you for that kind introduction. It’s a pleasure to be here in Nashville with all of you today. This is truly a pivotal time in aviation history.We are moving into the Next Generation air transportation system, or NextGen – transforming from the ground-based navigation of the last century to the satellite-based navigation of tomorrow. We are also moving towards an aviation system that will be safer, more efficient and environmentally sustainable – with more direct routes, fewer delays and more predictability. It’s not just the United States. The entire world is changing the way it handles air traffic. Now, we know that in order to meet the challenges of transforming our air traffic control system in the next 15 years, the FAA as an organization must also evolve. Our agency grew around 1950s-era technology and software systems. And, I might add that these systems are extremely safe and work very well. During that same time period, the computing power of a mainframe that took up an entire room now fits in a light-weight tablet. Cameras have evolved from film to digital. And the number of Web sites has grown exponentially from hundreds in the early 1990s to hundreds of millions today. Likewise, we need to transform our system for managing air traffic too; NextGen is the way of the future. We cannot afford to be left behind, and it’s important that all of us embrace this process. In many ways, the FAA is at a tipping point where we have a lot of things happening at once. We have the immense technological change of NextGen on the one hand, and we have a generational change in our workforce on the other. Change of this magnitude is not easy, but it is a unique and exciting opportunity for all of us. We are facing a whole new way of thinking and operating. And we are positioning ourselves with stretch goals to meet these challenges in the months and years ahead. We have taken a good long look in the mirror and we know we need to make certain changes that will serve as the foundation for our success in years ahead. We’re focused on streamlining shared services within the FAA to avoid duplication and increase efficiency. We’re studying our current governance model to ensure we’re prepared to manage issues across the FAA as effectively as possible. And ultimately, what we do comes down to people, 47,000 FAA employees. That’s why we’re also updating our human resources model to ensure we are attracting and retaining top-notch talent across the board. As I talk about the FAA’s strongest asset, its people, let me briefly describe the changes that are taking place in our workforce, in terms of generations, to illustrate the degree of change we are undergoing as an agency. We are going from baby boomers to GenXers and Millennials in air traffic control and other areas. The FAA hired a substantial number of controllers in the years immediately following the 1981 air traffic controllers strike. Those workers are now coming to the age where they are ready to retire. Last year, about 18 percent of the air traffic controller workforce was eligible to retire. And we estimate that we’ll need to hire about 1,000 controllers per year for the next 10 years. Already in the last five years, we’ve hired more than 7,800 controllers. The percentages for potential turnover are even more pronounced in other areas of the agency. Let’s talk about aviation safety inspectors. About 47 percent of aviation safety inspectors will be eligible for retirement within the next five years. And about 41 percent of our acquisitions workforce will be eligible as well as 31 percent of the agency’s engineers. I know many of you have studied engineering, science and math – or you are in school now – so let me tell you – all of those skills are a good fit for those jobs and the needs we have at FAA. People are our strength, and we need a workforce that has, above all, a core commitment to safety and professionalism. But we also need to make sure we have people with the skills and talents needed for the NextGen air traffic system. It turns out that what has been an ongoing and profound change in the FAA workforce has a positive side in terms of moving the workforce towards embracing new technology. We have noticed that the Millennial workers have a very different orientation to technology. They are much more comfortable with all kinds of technology and they are demanding that we use it. Rather than being nervous about new technology, they are anxious for the next upgrade. They are waiting in line for the iPhone 2 and 3 and 4 and 4S. These new workers don’t want to be handed a memo at work, they want to receive it automatically on their phones. And we’re listening and changing. Several months ago we released MyFAA Mobile – which makes basic information from the FAA employee Web site completely available to employees. And just yesterday, we took another step. We released a mobile phone optimized version of FAA.gov which provides much of the most popular information and services that pilots and industry stakeholders and the public at large are looking for. This will make all kinds of public FAA information easily accessible. To continue our transformation, the FAA is working with many partners to develop and foster a workforce that is schooled in the STEM disciplines – science, technology, engineering and math. This is not a matter of focusing on high schools or junior colleges. To do this, we must reach down into middle school and start fostering the kind of attention on STEM disciplines early on. There’s both a huge demand and a huge shortage for these kinds of skills in the United States. I am very proud of our partnership with AIAA in this effort. And I thank you for your support. We rely upon you to help us meet the challenges we face in this area. To promote STEM education, we are mentoring teachers and working with others to hold boot camps for educators. We encourage teachers to give their lessons with an aeronautical twist. For example, when we teach the laws of Sir Isaac Newton, we ask them to consider using the four forces of flight as an example – lift, weight, thrust and drag. If they are going to talk about navigation, we ask, why not use a visual flight rules sectional chart to teach the lesson rather than the typical road atlas? There’s a myth that aeronautics is so difficult that the average teacher can’t handle it, and we want to bust that myth. Our partner in this effort, NASA, has developed an “app” for that. We will be assisting with the launch this month of the “app” called Smart Skies, which teaches children basic algebra through a simple air traffic control simulation. Instead of playing “Angry Birds,” they can play air traffic control. This is an ongoing effort and we very much appreciate the partnership with AIAA, the Air Force, NASA and others to continue to foster aerospace and astronautic education. It’s in everyone’s interest to support STEM. And now I want to turn your attention to another issue that really does deserve everyone’s support, and that is the upcoming reauthorization of the FAA. The FAA’s current spending authority expires on January 31. We have now had more than 20 extensions. We need an FAA reauthorization bill in order to give the taxpayers and the traveling public the aviation system this country deserves. When Congress returns to work later this month, the House will have only six days in session before this important legislative work needs to be accomplished. This is something that is of extreme importance for the nation’s economy. Civil aviation contributes $1.3 trillion to our economy and generates more than 10 million jobs. And NextGen is vital to protecting these contributions. The current system simply cannot accommodate anticipated growth. In closing, I want to give you an update on a great NextGen project we kicked off in Houston yesterday. We talk about NextGen as something in the future. But there are many benefits of satellite-based navigation that we are deploying right now. And in the Houston metro area we are creating NextGen solutions at two major airports and the surrounding airspace. These are part of President Obama’s effort to fast-track needed infrastructure projects to help the economy and spur growth. The FAA is creating Performance Based Navigation procedures, along with environmentally friendly Optimized Profile Descents, which allow aircraft to make managed descents at reduced engine power settings, thus saving fuel and generating fewer emissions. These are part of the “invisible,” but very real infrastructure of our aerospace system. Yesterday we had our version of a groundbreaking on these important infrastructure projects. These changes are forecast to save millions of dollars in fuel per year and also cut greenhouse gas emissions by thousands of tons. We expect these “green” procedures to be completed in the next two years. To do this, we are streamlining our process for environmental studies. And this streamlining is going to save a lot of time. Rather than designing and engineering a set of procedures and working until all the “I”s are dotted before sending it over for environmental review – we are doing much of the preliminary environmental work concurrently with the design process. This way we are able to identify and mitigate environmental issues earlier in the process. We expect to shave a year off the process this way, and make these NextGen solutions available all the more quickly by doing this kind of workflow change. That is what is happening in Houston and we hope it will serve as a model for other metro areas around the country as we redesign airspace nationwide. This is just one example of the improvements we’ll see through NextGen. As we move forward, our goal is to reach the next level of safety and prepare our workforce for the future. This is a very exciting time in aviation. Together we are creating the template for a new system. I appreciate your help, your energy and your bright ideas as we embark on the next century of flight. User fees in aviation seem to be the bad idea that will never go away. For as long as I have been associated with aviation I have heard talk of user fees hitting the industry. The current proposal from the White House calls for a $100 per-flight fee to help lower the federal deficit. For those not familiar with the industry that may not seem like a huge deal, and it isn’t, for the major airlines who will simply pass on the fee to their customers which works out to practically nothing per passenger. For general aviation users $100 could easily be a large percentage of their overall costs. Supporters of the fees argue that everyone using the system should pay their fair share, but I guess that all depends on your definition of fair. Currently the air traffic control system is funded largely by taxes on fuel that are substantially higher for general aviation users than commercial airlines. The following excerpt from an article at aopa.org gives great insight into the current system and what really should be considered fair. Paying the 21.9-cents-per-gallon tax on noncommercial jet fuel, operators of a Gulfstream IV business jet would pay about $87 in fuel taxes. The commercial jet fuel tax is 4.4 cents per gallon; even with a much higher fuel burn, operators of an Airbus A320 would pay about $68 in fuel taxes. It doesn’t take a rocket scientist to figure out that general aviation aircraft are already paying their fair share. Unfortunately it appears that the people who are making the decisions don’t seem to understand the industry. The aforementioned article also points out the ambiguities in the wording of the proposal which further shows the lack of true understanding by the authors. I’m sure it is not really surprising to anyone that a government proposal would be filled with ambiguities, but it has to call into question the proposals validity. User fees don’t appear to be a reality in the immediate future, but they also don’t appear to be going completely away. Having used the current air traffic control system I totally agree that getting the NextGen system up and running is of the utmost importance, but doing it at the expense of the people who use and support that system just doesn’t seem to make sense.